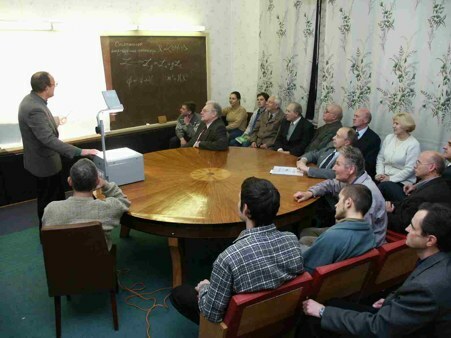 The Institute for Theoretical Physics of NSC KIPT was established on January 31, 1996, under the order of the President of Ukraine of 23 June 1993 about the formation of the National Science Center KIPT and was formed on the basis of theoretical departments existing in UFTI-KhPTI since the beginning of the 1930s. The credit of engaging the theorists and formation of theoretical unit in UFTI belongs to its first director I.V. Obreimov. The first head of the theoretical department was D.D. Ivanenko (1928-1931). From 1932 to 1937 the theoretical department in UFTI was headed by L.D.Landau, who laid down in Kharkov the foundations of his school of theoretical physics becoming world famous. After Landau’s leaving for Moscow the theoretical department was headed by his disciple A.I. Akhiezer, and in 1941 another theoretical department was created at UFTI under the guidance of I.M. Lifshitz. After Lifshitz’s moving to Moscow in 1968 this department was in turn headed by A.M.Kosevich, Ye.V.Inopin, A.S.Bakai. When in the early 1990s in a difficult economic situation the KIPT had to be reorganized, A.I. Akhiezer was an ardent supporter of a separate institute for theoretical physics, being a constituent of a newly created National Science Center KIPT. By this time his department was headed by his disciple S.V. Peletminsky. Alexander Ill’ich Akhiezer did everything possible for formation of the Institute for Theoretical Physics and to subordinate the National Science Center KIPT to the National Academy of Sciences of Ukraine. 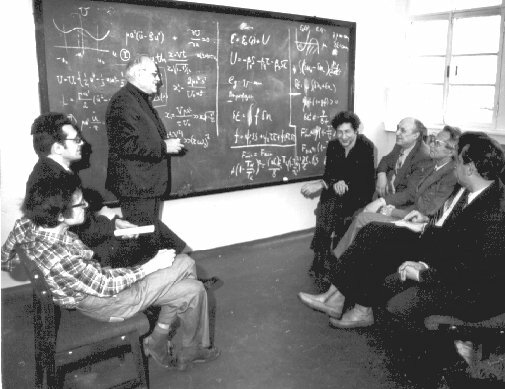 In 1996 the part of his plan was realized and the Institute for Theoretical Physics was established. The NSC KIPT was affiliated with the National Academy of Sciences of Ukraine in 2004, already after the death of A.I. Akhiezer. In 2003 a decree of the Ukrainian Cabinet gave the name of academician of the National Academy of Sciences A.I. Akhiezer to the Institute for Theoretical Physics of NSC KIPT. The concept of supersymmetry was offered, on the basis of which the representation of spin 1/2 Goldstone fermions was introduced and, for the first time, the basic concepts of the supergravitation theory were formulated. The idea of supersymmetry allowed to eliminate a number of basic difficulties of the quantum field theory and provided one of central ideas of constructing a unified theory of fundamental interactions, including gravitation. Various aspects of supersymmetry, supergravitation, superstrings were developed; the mathematical apparatus of the supersymmetry theory and its applications in the elementary particle physics were elaborated. In the framework of the earlier proposed extended supersymmetric quantum mechanics a procedure of constructing exactly solvable models with multi-well potentials was developed and used for the theoretical analysis of real physical processes. Based on the formalism of supersymmetric field theories new duality-symmetric models of supergravity and string theory were constructed, new solutions to the Einstein's equations with matter fields were established, and various aspects of the gauge/gravitational duality were studied within the effective hydrodynamic description of relativistic media at a strong coupling constant. A cosmography of a wide class of cosmological models was constructed. The influence of the interaction in the dark sector on the dynamics of the universe was investigated. Theoretical seminar, 1986. At the blackboard - A.I.Akhiezer. A theoretical approach was developed for description of the rare decays of heavy B mesons that are induced by neutral currents changing the quark flavor. In order to study the CP properties of the Higgs boson a theory was developed for the decays of this boson into photon and Z boson, and also into photon and lepton pair. The decay of the Higgs boson into two off-mass-shell Z bosons followed by the decay of the Z bosons into fermion-antifermion pairs was studied in order to determine the structure of the HZZ interaction. With the help of the relativistic Dirac wave equation, the properties of a massive neutral particle with zero spin as a candidate for dark matter were investigated. Within the Hamiltonian formalism of the relativistic quantum field theory, an algebraic approach was developed to ensure relativistic invariance, taking into account noncovariant and nonlocal contributions to the interaction Hamiltonian of elementary particles. Theoretical analysis of the experiments ALICE, ATLAS, CMS and LHCb at the large hadron collider at CERN was carried out. Microscopic optical potentials were built for the description of the interaction of nucleons, deuterons, and alpha-particles with atomic nuclei in a unified self-consistent approach together with the description the nuclear matter and the structure of finite nuclei. An approach was developed for description of the intermediate-energy deuteron scattering on the alpha-cluster nuclei and an analysis of experimental data on the cross sections and polarization observables for these processes was performed. An analysis of properties of the even-even extremely neutron-rich nuclei was performed with allowance for the axial deformation of nuclei, and it was shown that peninsulas of nuclei that are stable relative to the emission of one or two neutrons can exist beyond the previously theoretically known neutron drip line. A quasiclassical theory of coherent scattering and radiations of high-energy charged particles in oriented crystals was advanced. A dynamic chaos phenomenon for fast particle movement in crystal lattice was predicted. A possibility of an anomalous diffusion for relativistic particles at channeling in crystals was shown. A new mechanism of particle beam bending at ultra-high-energy, using bent crystals and nanotubes, based on the process of multiple scattering of particles on atomic rows was offered. The effects of suppression of the Bremsstrahlung and coherent radiation of ultra relativistic electrons in thin layers of amorphous and crystalline matter were predicted. A possibility of similar effect for collisions of short bunches of relativistic particles was found. A theory of the relativistic electron transition radiation at ultra large radiation formation lengths (up to several hundreds meters) was developed. A theory of the phenomenon of slow nuclear burning in multiplication medium was advanced. The physical basis of the perspective concept of the fast reactor with the so-called "internal safety" operating in a self-sustaining mode of the wave of nuclear burning was developed. A special mechanism of negative feedback in the reactivity was discovered and in details investigated, which mechanism ensures stability of the wave of nuclear burning in relation to perturbations of the reactor neutron field. A package of computer codes for numerical solution of the non-stationary nonlinear diffusion equation for neutrons in the multiplication medium and for simulation of transients in the reactor with a wave of nuclear burning was developed. The efficiency of using mixed U-Pu fuel in such reactor was shown. The problem of determination of the non-equilibrium entropy of interacting particles was solved. The microscopic theory of irreversible processes in condensed systems with the spontaneously broken symmetry was advanced. A Fermi-liquid approach to superfluid liquids was developed, that was applied to the study of equilibrium and kinetic properties of superconductors. A statistical approach to problems of classification of equilibrium states in condensed media with the spontaneously broken symmetry was developed with the application to the analysis of equilibrium states with vector and tensor order parameters. A new formulation of the secondary quantization method for bound states of particles was proposed. A method of the reduced description of macroscopic non-equilibrium fluctuations was developed. Kinetic and hydrodynamic theories of long-wavelength fluctuations were constructed in microscopic approach on the basis of this method. A number of applications in the turbulence theory, in "the long hydrodynamic tails" theory, and the quasilinear theory of plasma were examined. A microscopic theory of interaction of ultra-cold gases with an electromagnetic field was constructed and the possibility of slowing down and stoppage both of light and microwaves in ultra-cold gases with a Bose-condensate of atoms in the absence of the artificially stimulated transparency of a medium was predicted. The requirements for the light speed control in a Bose-condensate were determined, the mechanism of the filtration of electromagnetic waves was proposed. A polycluster model of amorphous solids was constructed; and the thermodynamic, kinetic, and mechanical properties of polycluster metallic glasses were described. The Kolmogorov-Johnson-Mehl-Avrami theory of phase transformations was generalized to the case of a bounded system. The problem of strength and sliding of a disordered atomic layer with an arbitrary distribution of local critical stresses, which has an application to the description of the mechanical properties of amorphous materials, was solved analytically. The evolution of the phase composition of binary alloys under irradiation was described. A theory of the radiation-induced vacancy swelling of quasicrystals was constructed taking into account the kinetics of phasons of vacancy and interstitial types. A theory of the first passage for Markovian Lévy processes with drift was constructed. The effects of anomalous diffusion in a medium with strong spatiotemporal fluctuations were investigated. A theory of the kinetics of the bimolecular reaction in a solution with linear traps was developed, which explains why in biological systems protein molecules use a combination of three-dimensional and one-dimensional diffusion for the fastest search for a target on DNA. A theory of Bose-Einstein condensation of interacting particles was developed.